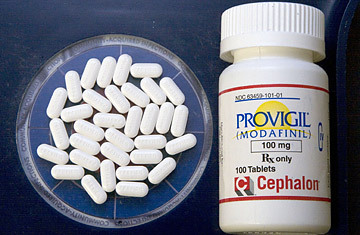 Provigil, a drug manufactured by Cephalon Inc. to treat sleep disorders. If ever there was a safe recreational drug, modafinil seemed to be it. The greatest little pick-me-up since the cup of joe  or so its enthusiasts said  the antinarcolepsy medication has helped recreational and casual users stay peppy without the benefit of sleep. As for addiction? Not to worry. The drugs that hook you most powerfully do their work by mucking about with the pleasure-inducing brain chemical dopamine, but modafinil doesn't go there. "Modafinil," as Slate magazine claimed in a 2003 posting on the drug, "tiptoes around dopamine." That was the thinking, at least  but the thinking now turns out to be wrong, according to a new study published on March 17 in the Journal of the American Medical Association. The authors say modafinil is not only the latest in a long line of chemical stimulants designed to keep users awake, alert and happy; it's also the latest to go straight to the brain's addiction centers in the process. But modafinil, in many ways, is a very good thing. It was first marketed for treating narcoleptic sleep disorders in 1998, but doctors soon began prescribing it off-label to control attention-deficit hyperactivity disorder (ADHD) and even the symptoms of schizophrenia. What starts off medicinal, however, often goes recreational, and modafinil soon developed a following among people (students, writers and others) who wanted alertness in a pill, either to become more productive or simply to have more fun. The researchers thus recruited a small sample group of 10 men, ages 23 to 46; some of them got a placebo, while others took either 200 mg or 400 mg (typical therapeutic doses) of modafinil. All of the men's brains were then scanned using positron-emission tomography (PET scans). Volkow and Fowler were looking for dopamine activity  not just for overall dopamine levels, but also for the behavior of dopamine transporters. "Dopamine transporters perform cleanup work," says Volkow. "They remove dopamine after it's released and recycle it." The more dopamine that gets left in the spaces between cells, the longer its rewarding effect on the brain  and the likelier it is to lay down the roots of addiction. As Volkow and Fowler suspected, the PET scans of the men who had taken modafinil showed that dopamine transporters were indeed being blocked by the drug and overall levels were rising. Worse, the drug does not do its work indiscriminately. Modafinil binds to the same site on dopamine transporters as cocaine does, and one of the areas where dopamine levels then begin to climb is the nucleus accumbens  a spot researchers have come to recognize as a sort of addiction central for recreational meds. "The nucleus accumbens," Volkow and Fowler wrote, is a "brain region critical for the rewarding effects of drugs of abuse." If there is anything that has so far prevented modafinil from becoming as widely abused  and as highly addictive  as some drugs, it's that it appears to lack the one-two punch of many other stimulants. Amphetamines, for example, don't just block the cleanup function of the dopamine transporters but actually boost overall dopamine output at the same time. That's a little like discontinuing your trash pickup at the same time you double the amount you're throwing away. Modafinil stops at step one  canceling the garbage trucks. Either way, you're going to make a mess, and surprisingly fast. Volkow points out that even without increasing dopamine output, modafinil blocks the re-uptake of more than half the amount the brain naturally releases. "This completely negates the argument that modafinil has no dopaminergenic effect," she says. "It does have the drug signature required to produce addiction." The safe party drug, once again, is not nearly as safe as it seems. Read "Why Falling off the Wagon Isn't Fatal."